When you land in Miami International Airport there are plenty of options for restaurants and shops if you are in need of a pitstop after your long flight. After that you can head out to the parking and pick up/drop off areas from any of the baggage claim area. Home to pastel buildings, vibrant nightclubs, and some of the world’s finest cigars, Miami is a great place to take a vacation or do business. Whether you’re just arriving or about to head out for a new adventure, Miami International Airport is a great place to say hello or goodbye. Offering a diverse choice of eateries as well as an easy layout that makes finding your flight as easy as finding the bathroom, you’ll be sure to have a smooth experience. Get to your flight quickly by making sure your parking situation is handled. MIA Airport offers three main garages, all of which are accessible on Central Boulevard. 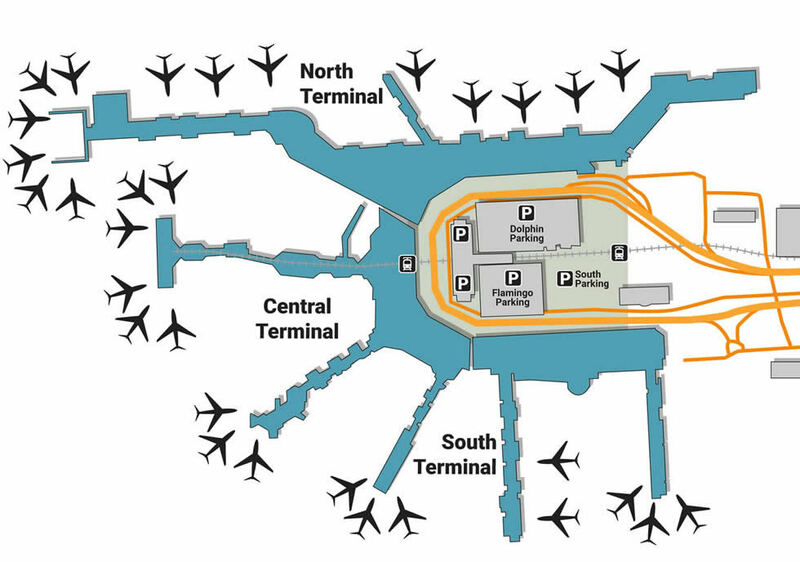 The Dolphin Garage is located on the north side, near Terminal D & E, the Flamingo Garage is located on Central side, near Terminal F & G, and the South Garage is located on the South side, near terminals H and J. Long-term parkers can stay a maximum of 60 days in the garages, which are located in the North and South Lot respectively near Terminals D and H.
Make yourself at home in the midst of a layover by enjoying the many services and amenities provided to guests. Get a flood of good thoughts before boarding by stopping by the Chapel at Terminal D’s 1st level, which offers Tuesday Christian sermons as well as Catholic Mass on Saturday. International travelers in need of a currency exchange should stop by the booths at either of the four locations on the 2nd level. If you lost something, visit the Lost and Found facility, located in Terminal D next to Bank of America. Kill some time by enjoying the Division of Fine Arts & Cultural Affairs, filled with striking contemporary works in amazing spaces. A great part of walking around an airport is not only feeling the excitement of a new place, but enjoying the immediate satisfaction of its unique retail stores. Get a trendy COACH bag by stopping at the condensed storefront located at Terminal J, or get a fancy new wallet at Leather & Co. (Terminal E). If you’re feeling splurgy, get a one-of-a-kind gemstone at Fire CZ ( Terminal J) to feel closer to the universe, enjoying the moonlight while taking in the sunlight with one of Sunglass Icon’s (Terminal J) fresh Miami shades. Get your fill on food while you wait for your flight, or your taxi, grabbing a bite to eat at a variety of restaurants. Stop at 305 Pizza, located at Terminal D West, for a delicious deep-dish, or enjoy some local Mexican at Cafe La Carreta, located at Terminal E’s food court. If you’re in the mood for a familiar sweet, get a smoothie at Jamba Juice, located in Terminal J. A popular airport snack that’s perfect for every moment, whether you’re arriving from the military or heading out on a long flight, is a Nathan’s Hotdog, located in Terminal D and H.